I had half a large round yellow courgette left over after cooking my pasta dish yesterday. I wanted to do something special with this home-grown vegetable, given to me by my daughter who’d grown it in her garden. To stuff it seemed such an obvious choice because once you’ve cut it in half and removed the seeds from the middle, there’s a wonderful cavity just crying out to be filled with something gorgeous. I loved stuffed vegetables. 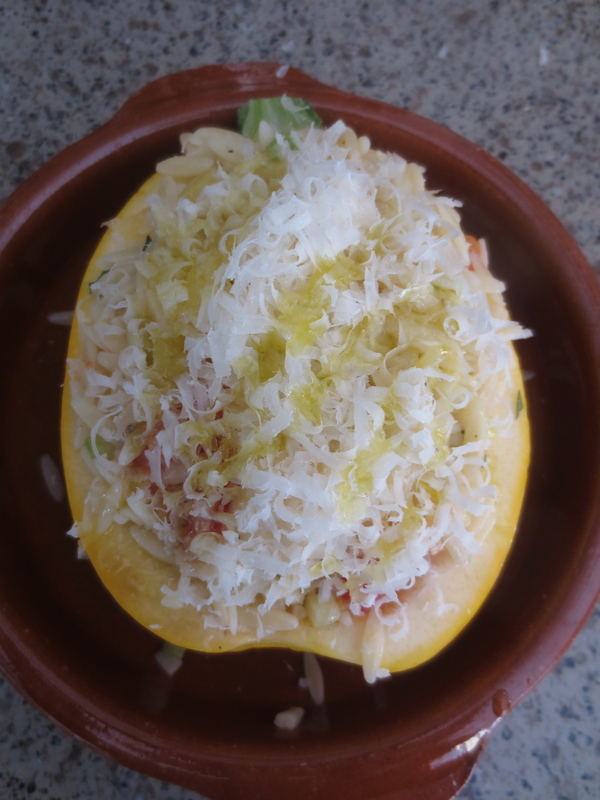 They make me think of Greece primarily – lovely stuffed tomatoes and peppers – but then in Istanbul I enjoyed wonderful stuffed aubergines, while recently in Nice, I sampled their speciality of little stuffed vegetables – Petit farcies. I usually stuff vegetables with a rice mix but I saw in Sunday’s Observer Magazine a Nigel Slater recipe for stuffed tomatoes using orzo instead of rice, and thought this a great idea. 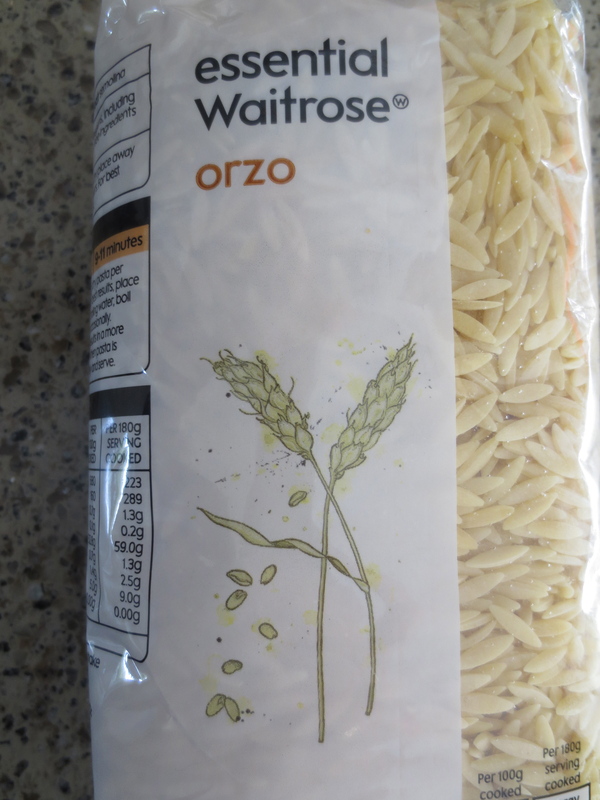 Orzo is rice-shaped pasta but of course being pasta it’s much softer in texture. It is not, however, the same as making an orzotto – which is a risotto made with pearl barley. It is small pasta and cooks and tastes like pasta and is usually used in soups and salads. I cooked this first so it could cool. I put half a cup in some boiling salted water and cooked according to packet instructions – about 11 minutes. I drained and then cooled by running cold water through it so it didn’t ‘cook’ anymore and stick together. Next I scooped out the seeds of the courgette and threw them away. 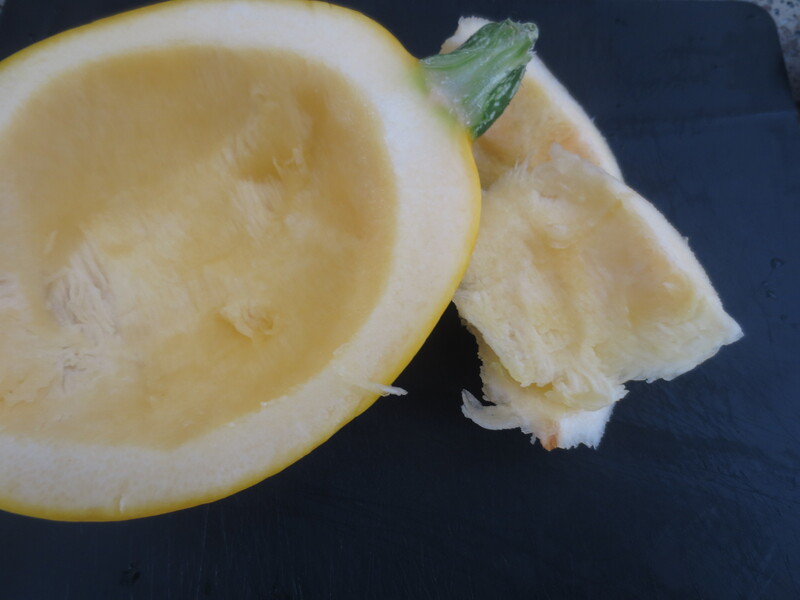 Then I cut away a little of the flesh of the courgettes with a spoon, leaving a margin of flesh to skin of about 1cm (you can see in 2nd photo). I chopped the flesh into small cubes. 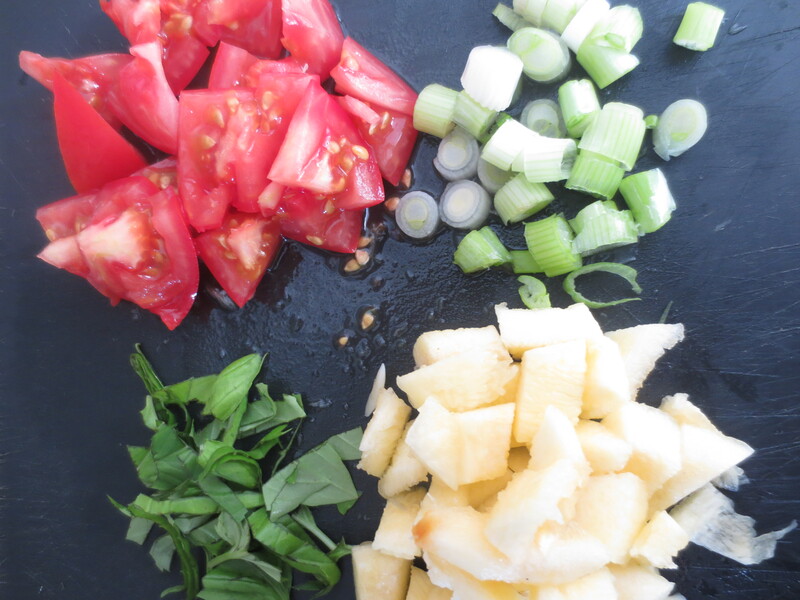 I also chopped 1 medium tomato, finely sliced 2 salad onions and roughly sliced a few fresh basil leaves. I gently cooked the onion and courgette flesh in some olive oil to soften. 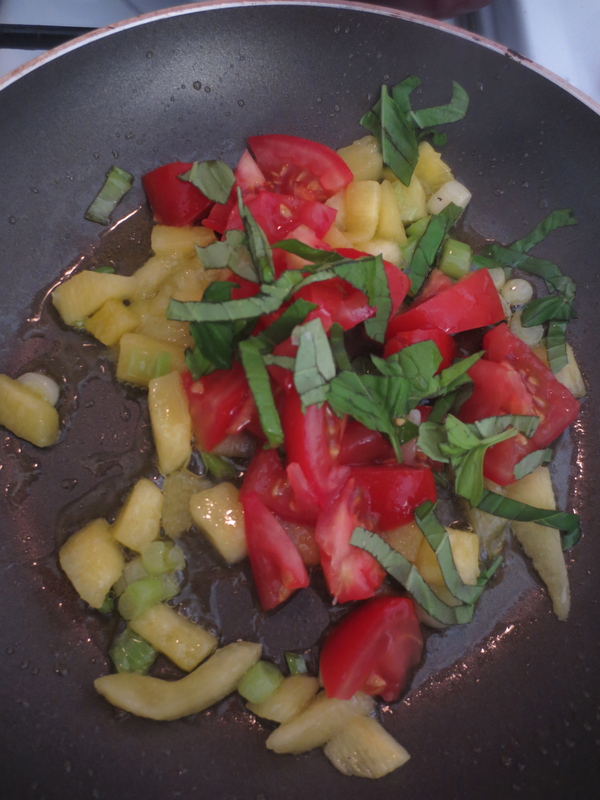 Then I added the tomato and basil and cooked for just a short time more and turned off the heat. I’d decided to add some Taleggio to the mix. 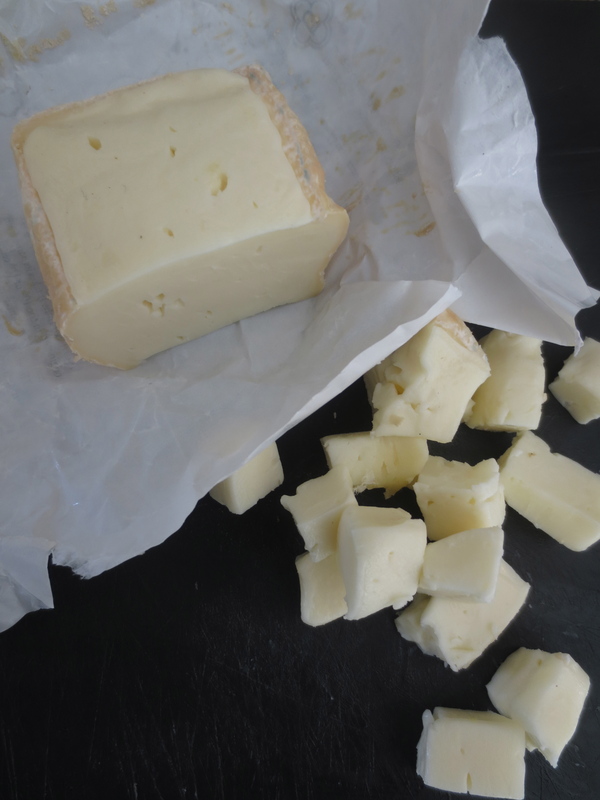 I love taleggio – it’s one of my very favourite cheeses. It comes from Lombardy in Italy and although I mainly eat it ‘raw’, I’ve discovered it’s wonderful cooked. I sometimes put it in risotto. It melts beautifully, a little like mozzarella, slightly stringy but with a fabulous flavour that enhances dishes wonderfully. I have to admit I chose it today because I had a large piece left over from the weekend when I’d bought lots of cheeses for a family light lunch of bread and cheese and some dips and olives. Putting the Taleggio in my stuffing seems a great way of using it up. 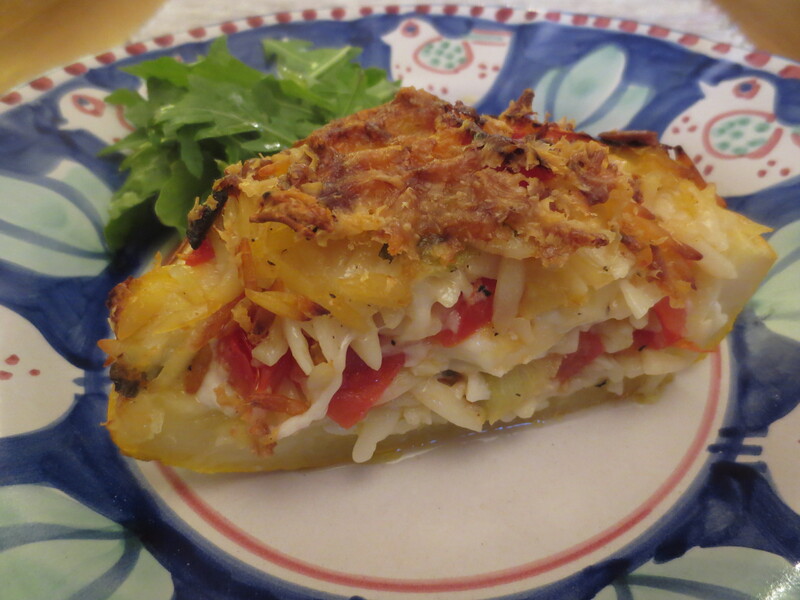 I liked the idea of it melting into the orzo and vegetables. 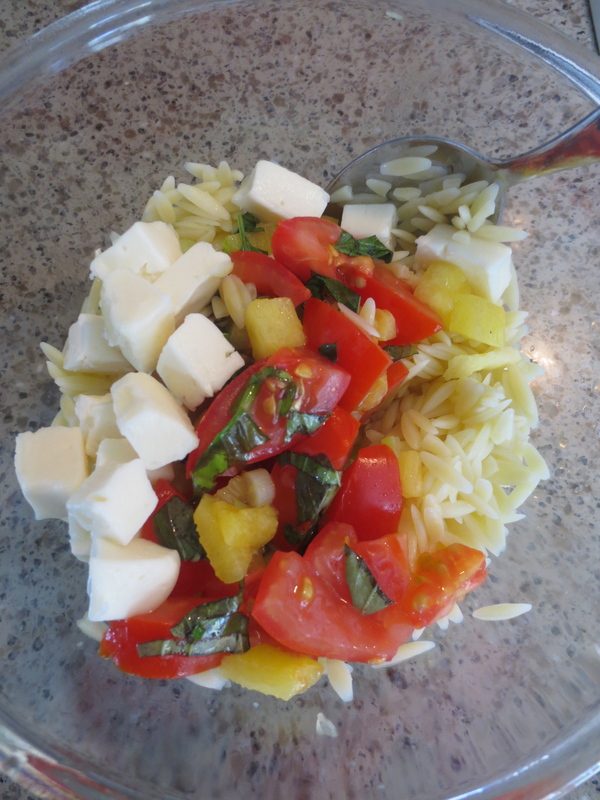 I cut two thick slices and cubed them and added them to the orzo. 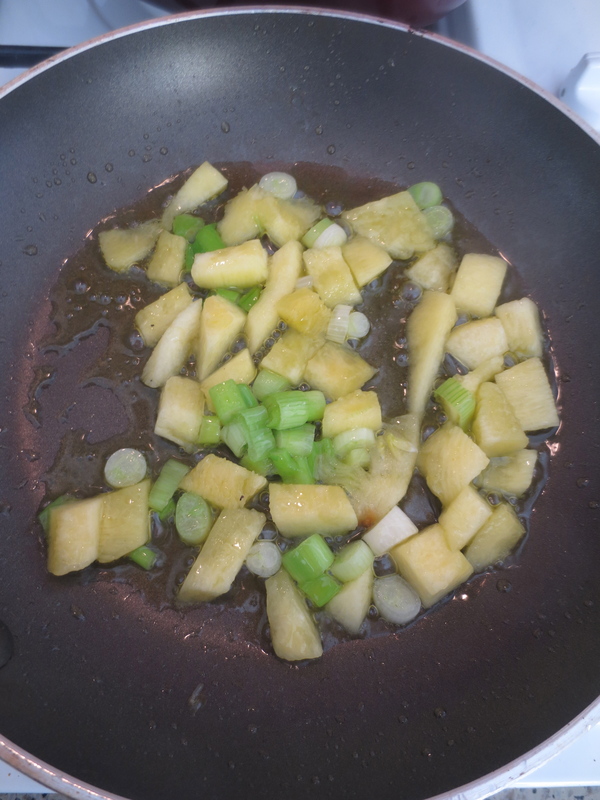 I then added the vegetables, scraping all the lovely juices from the pan. I mixed it well together and then stuffed the courgettes. I grated some Parmesan over the top and drizzled over some extra virgin olive oil before putting it into a 200C/180 Fan oven for an hour. Stuffed vegetables are better served warm rather than hot; that’s the way the Greeks always serve them and it’s also better for digestion – warm rather than hot food. I actually cooked the courgette at lunchtime as I was going out early evening to my book club and have to eat quite early – about 5.45-6.00 – and then I heated it through to a nice warmth just before eating. I was really pleased with it. 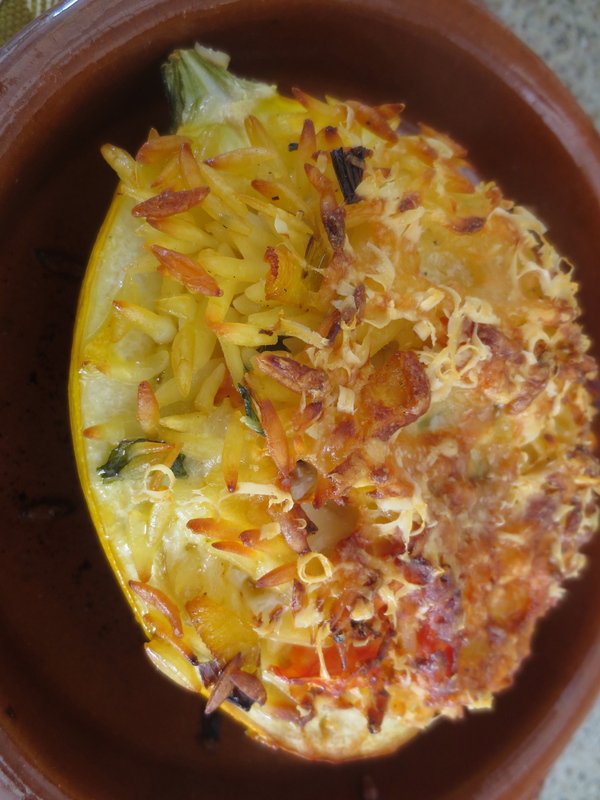 I loved the orzo stuffing – thank you Nigel Slater! – as it was gorgeously soft but took up all the lovely flavours of the courgette and tomato and basil and that gorgeous gooey Taleggio. Of course, if you don’t happen to have a lovely home-grown yellow courgette, the stuffing will work well with marrow, ordinary courgettes, peppers and tomatoes. Great dish! 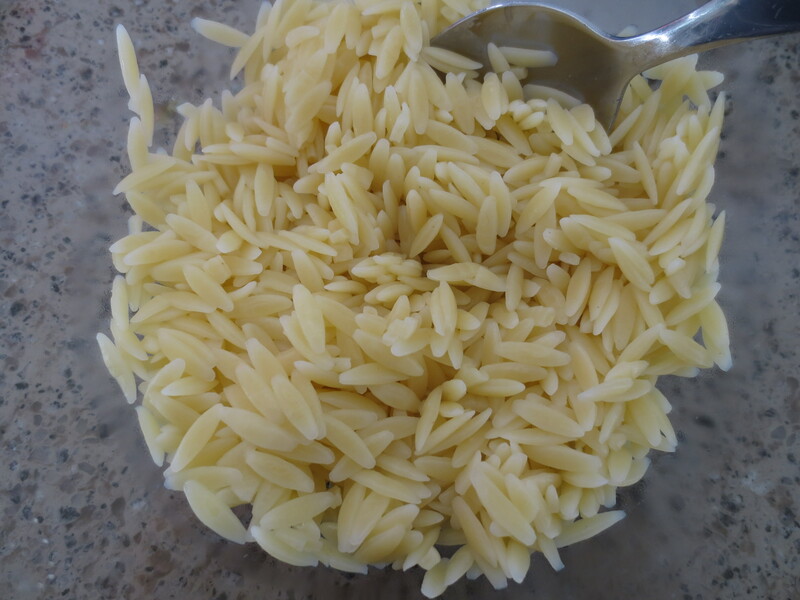 I love taleggio and the orzo is such a great idea!